November marks our first year living in our apartment–the longest, by far, that we’ve stayed in one place! 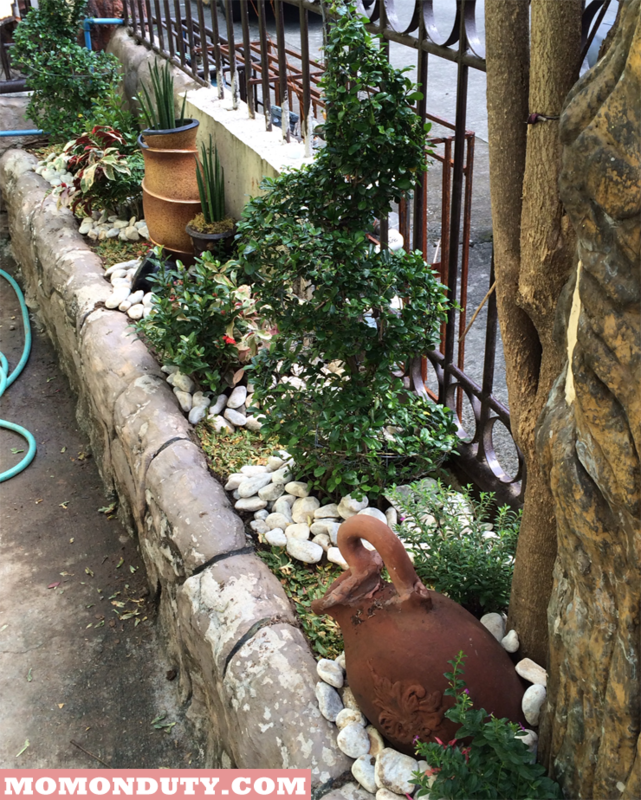 To celebrate our anniversary, Arjay and I decided to beautify our neglected garden. 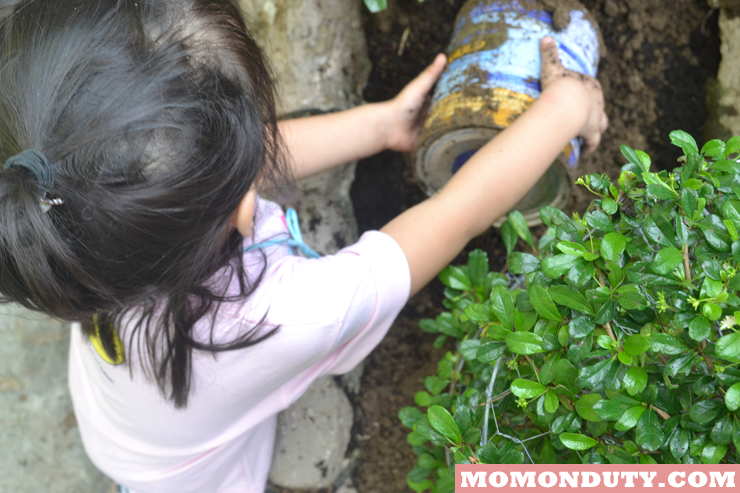 Would you believe that everything in our home garden only cost us PhP2,000–plants, rocks, jars, and soil! If you’re from Rizal, you can buy all these stuff for your home garden near the new wet market of Taytay. There’s a long line of stalls there! Anyway. I don’t have a before photo of this little pocket, but to give you an idea, it was just a bare plant box where we piled all our unused stuff on. It wasn’t a pretty sight…at all. But aside from our home anniversary nearing, we really took on this project because The Princess’ school encouraged us to work on an eco project as a family. 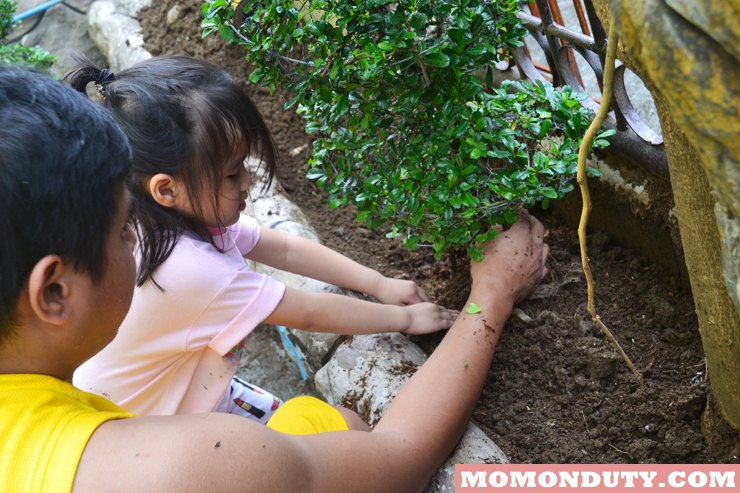 We missed the tree planting activity of the local government last month so we decided to just give the minis a lesson on being stewards of the Earth by creating our little pocket of green that they will be taking care of. 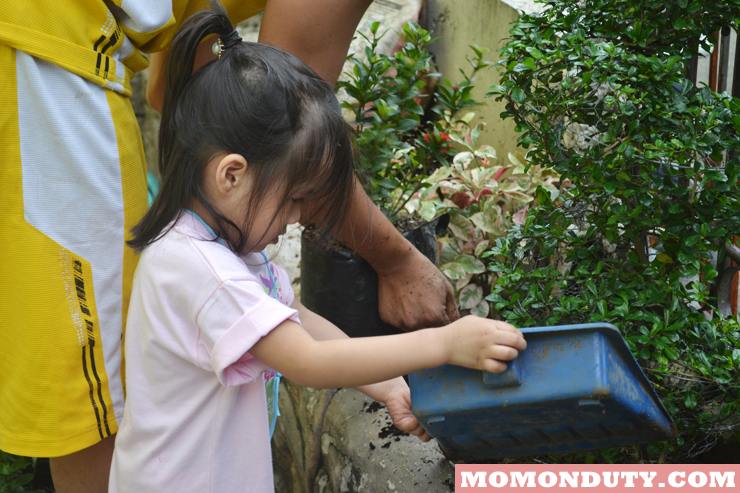 Gardening is a nice bonding activity you can do with the kids on weekends. This is also the perfect opportunity to teach them about ecology and why we should take care of the environment. Moreover, having something they are tasked to look after is a great way to develop responsibility! Have you done something similar with your family? If not, I urge you to work on an eco project as a family as well! It’ll be fun! Hi, there Kim. I also love gardening and it’s nice to see how u guys turn the small space into beautiful garden. Hi Joan! Thanks for dropping by. 🙂 We’ve actually been thinking about this project for months. What was hindering us from working on it back then is the fact that we have such a small garden space. It’s a good thing that our daughter’s school asked us to work on this project so we really found a way around the space issue. We’ve also started growing veggies at the opposite side of this garden. Hi, Kim. We’ve moved in to a new place 7 months ago and our place here has a little space for gardening. It’s a dream come true because I can now have my own garden. I already planted some veggies here too. It’s really nice to see butterflies here and some birds pays a visit too. I heard from a friend who grows herbs that you’re not supposed to put them under direct sunlight? Parang baby lang na papaarawan mo in the morning then you’ll have to keep them in a shaded area when the heat gets intense. Correction: I’m lucky I have a husband who has a green thumb. LOL! 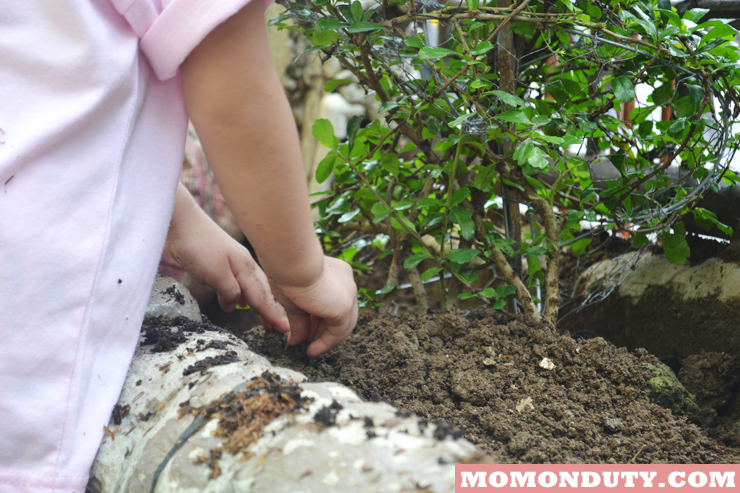 It’s a nice project for the kids too because they’ll know the importance of plants in our life. I wish we had a space for gardens. We live in a condo complex so it’s not possible. Probably potted plants but that’s it. Looks like a fun activity! No garden space for us here in our unit since we live in a condo but we are planning to grow and put potted plants. Nice bonding activity no? I want to try planting herbs too! We have a basil plant here, but that’s it. I’m hoping to add more. Yep, I’m always on the laptop too! Gardening is a nice addition to my routine. Looks like you have a little help from a little one there.. It’s nice to have some green plants around the house.. 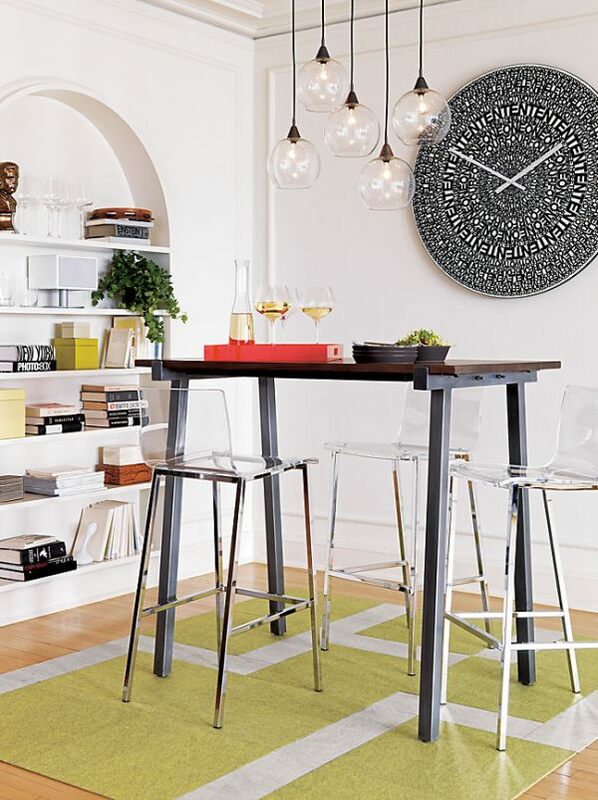 Your “DIY” garden doesn’t look shabby at all! It actually reminds me of my brother’s bonsai garden. Gardening has a lot of benefits for kids, I read! Nice project. And its important din talaga na there’s a space in our home for greens. 🙂 Nakakarelax eh. 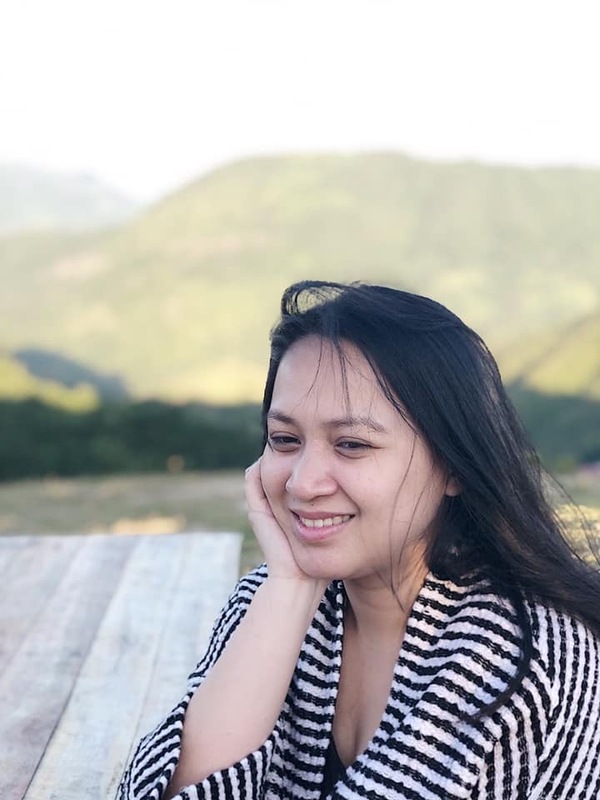 That’s true 🙂 A green space, no matter how small, is really relaxing. What a nice project and it seems fun for the kids. I should try this with the kids next time. Though I’m not into gardening, I really admire nice-looking gardens so maybe the end goal would get me into getting my hands dirty hehe.